Mary McLeod Bethune (1875-1955) was a highly favored and influential educator who spent her life teaching and educating African Americans. However, most people don't know what U.S. President made her special advisor on minority affairs, or what her and James M. Gamble of the Procter and Gamble Company of Cincinnati, Ohio, have in common. #1 - Mary was one of 17 children born to former slaves in Mayesville, South Carolina. #2 - She was 11-years old before she started attending school. She had to walk 5 miles to get there. #3 - Later, she received a scholarship to attend Scotia Seminary, a school for African American girls in Concord, North Carolina. #4 - She loved dancing and music. She was a good student, and other classmates looked up to her as a leader. #5 - She wanted to be a missionary in Africa, but at the time African Americans were not allowed to do this. #6 - When the railroad came, hundreds of African Americans came looking for work. 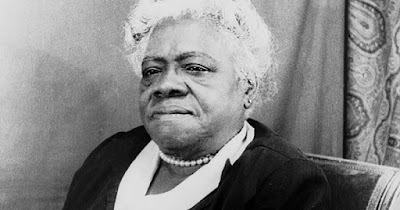 She saw a need to teach their children, so she established a school for African American girls in Daytona Beach, Florida in 1904. She convinced James Gamble of the Procter and Gamble Company to contribute to the school, and he served as chairman of its board of trustees until his death. #7 - The school had no equipment or supplies and started with 5 girls and one boy; the boy was her own son. They made and sold pies and homemade ice cream to make money for the school. #8 - The school prospered, and in 1923 merged with Cookman Institute of Jacksonville, Florida, a school for boys. The new school became known as Bethune-Cookman Collegiate Institute and later renamed Bethune-Cookman College. Bethune served as president of the college until 1942 when she retired. #9 - Franklin D. Roosevelt appointed her director of African American affairs in the National Youth Administration and a special adviser on minority affairs. She also served as special assistant to the secretary of war during World War II. During this time she became a close friend of Eleanor Roosevelt. #10 - She was an adviser to several American Presidents.